There's no Times at all...'cept the New York Times. It's official: the Kishida and Ishihara factions of the Liberal Democratic Party yesterday declared themselves in favor of the reelection of Abe Shinzo as president of the LDP. Barring an accident or illness, Abe Shinzo is both the present and future leader of the party and the country (Link - J). The question now -- and since the outcome is preordained it is not much of a question -- is whether or not there will even be an election. A candidate would have to come out of the ranks of the party's non-aligned members. While there are some leading lights among the non-aligned, even a few former candidates like Ishiba Shigeru, the sheer cussed pointlessness of setting up a run for the presidency when all 7 factions are lined up behind Abe should deter even the most ornery from running. The legions of the most ornery in the LDP are paltry indeed: only two Diet members -- the larger-than-life Murakami Sei'ichiro and the anti-Abe media favorite Noda Seiko -- even attempt to adopt the stance of opposition to Abe government policies. It is possible that the leadership of the LDP might ask one of the party mavericks to at least try to mount a campaign. Such an attempt would benefit the party: it would foster of the illusion that democracy survives in Japan. One cannot imagine, however, how a pantomime fantasy farce candidacy would even leave the starting block. There is the little technical matter of a candidates's needing to corral 20 other LDP Diet members into supporting the challenge to Abe's leadership...Who could muster five, much less 20 Diet members into tarring themselves with the brush of "Not An Abe True Believer"? When the September 8 declaration date rolls around, no one will stand against Abe. He will be reelected at the moment his aides register his candidacy. Huzzah! Abe, Abe, he's our man! If he can't do it no one can. Statiscally, politically, whatever. No one can. Abe Shinzo: he's The One. Later - Right after posting, The Japan News (translated stories of the Yomiuri Shimbun) checked in with a long article explaining some more of the background to the automatic reelection of Abe as party president (Link). The Yomiuri story throws yet more cold water on the "Let's Draft Noda Seiko" narrative. With Abe's reelection to go unopposed, the focus of LDP politics switches to the guessing game around the new Cabinet lineup expected to be announced just before an extremely brief (1 month?) extraordinary session in the autumn. Who among the many Cabinet eligible mid-career members of the LDP will be incepted? Who will be left out, forced to accept a lesser Vice Minister post, or a directorship of an LDP division? 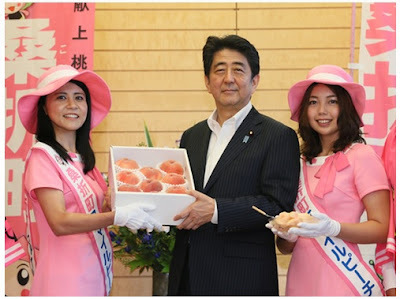 What we do know is by all lining up behind Abe's reelection, the faction leaders will each have the right to nominate one Abe-cannot-refuse-me cherished princeling subordinate to the new Cabinet. Beyond these seven, a Chief Cabinet Secretary from Abe's home faction (one expects that Suga Yoshihide will continue to labor on in what is arguably a better buddy-buddy act than the Koizumi-Takebe pairing) and a few "Friends of Shinzo," the selection process for the remaining spots will be a crap shoot. Can Abe Save The Tokyo Olympics? Will Abe Take A Trip Down Yasukuni Lane This Day?